Enjoy a simple cooking activity with your students after reading Dance of the Swan. 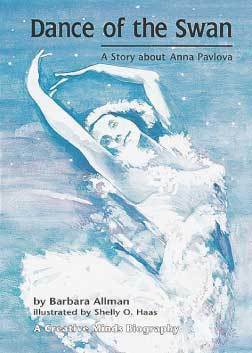 When Anna Pavlova toured Australia and New Zealand in 1926, a chef created a new dessert in her honor and named it the Pavlova. Meringue nests or cookies purchased from your favorite bakery or specialty food store. Fresh or canned fruit pieces--kiwi slices, pineapple chunks, mandarin orange pieces, strawberries, blueberries, raspberries, or peaches. Fill the meringue nests or top the cookies with whipped cream. Arrange a colorful selection of fruit pieces on top of the whipped cream. Sprinkle on nuts if desired. Enjoy immediately! Note: All cooking activities should be supervised by a responsible adult.